London is a city of romance, bursting with after-dark activities, magical sights and fabulous eateries. LondonTown has chosen a selection of restaurants that are guaranteed to make your dinner date a night to remember. The service and food at each of these places are fit for royalty and will add the required romantic flavour to your evening. Paris may be known as the city of romance but London is the capital of love. Impress your date by ordering champagne with the press of a button. There's no danger of your toast turning up cold at this sophisticated all-day designer diner - here you get a toaster on your table at breakfast so you can serve yourself from 7am. This Soho eaterie is headed up by James Walker, former head chef at Le Pont de la Tour and boasts a David Collins design (responsible for makeovers at the Wolseley, Claridge's Bar and, lately, the Artesian bar at the Langham). Bob Bob Ricard (BBR) brasserie and bar puts the emphasis on English comfort food with the front of house overseen by the former maitre d' of the The Ivy - adept at dealing with diva-like celebs. A champagne trolley and fab late night cocktails like Bramley Apple Martini add glamour to this hotly tipped spot. The extended opening hours until 3am - sadly the exception rather than the norm even in a city as thriving as this - ensure the party atmosphere gets going especially on weekends. Dinner with unrivalled views of London. Like the Hong Kong original (on the 28th Floor of One Peking), Hutong in London occupies a lofty spot, high up on the 33rd floor of The Shard, London's tallest building. Hutong is a restaurant with a view - even the loos have that view. David Yeo's Chinese restaurant is, according to Jay Rayner writing in the Guardian, a "high-end take on the fiery food of northern China". Yes, the prices may be "a poke in the eye from a chopstick dipped in salty Korean chilli sauce" (Jay Rayner), "but the views from The Shard are undeniably worth it", writes Matthew Norman in The Telegraph. Established in Hong Kong in 2006, the restaurant is well known for its sophisticated Northern Chinese flavours including dishes of braised beef rib wrapped in lotus leaf, crispy de-boned lamb rib, soft shell crabs in spicy peppers and crispy Peking mutton. The interior is decorated with traditional Chinese red lanterns, hand-carved wood-panelled 'Moon Gates', and a wall of tiled tea bricks (compressed dried Chinese tea) while vintage 1940s tea canisters are a nod to the link between China and London and its old tea warehouses. One of two restaurants in the Shard operated by Yeo's Aqua Group, Hutong sits above Aqua Shard which serves a modern British menu on the 31st level of the skyscraper building. Hidden in a cobbled courtyard, this is an excellent spot for a romantic dinner. With chandeliers, oak tables and a changing British menu, this is a grand romantic option. Dripping candles, red wine and joie de vivre. 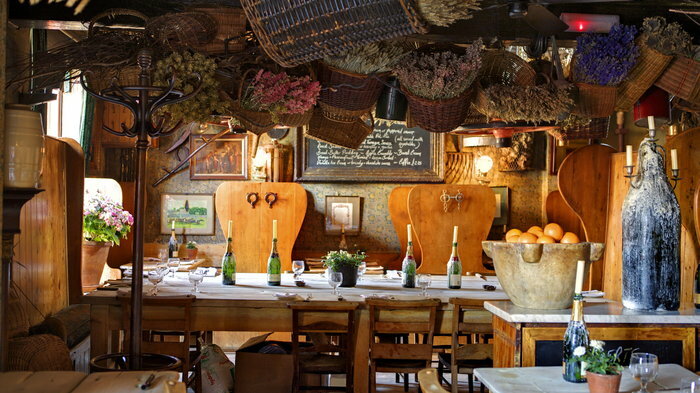 This French bistro would be comically cliched if it wasn't, in fact, the genuine article: the hanging baskets, cramped wooden furnishings, and rustic decor have been a Chelsea favourite since it was set up by emigres in 1962. Rabbit stews, fish soups and other bistro classics come lovingly prepared, and in suitably lavish portions. Romantic dinners are a specialty at La Poule au Pot and many lovers have bonded in appreciation of their magical steak b'arnaise, fresh fish and foie gras. The vin de table is served in a magnum and you only pay for what you drink, a policy which perfectly reflects the unpretentious atmosphere. An intimate restaurant with a Venetian style menu. Since launching the original Polpo in Soho's Beak Street in October 2009, Russell Norman and business partner Richard Beatty have expanded the brand at breakneck speed. With Polpo Smithfield, their sixth London restaurant (and the first outside Soho) launched in 2012, they have created a mini chain under the Polpo name - including Polpo Covent Garden and Polpo Notting Hill. All four offer the same Venetian style menu on offer at the Soho restaurant. This Smithfield branch has 70 seats in the main dining area, seating for 20 outside, and a Negroni Bar in the basement. When it first opened Libby Greenfield left the Polpetto kitchen where she was senior sous chef to Florence Knight to head up this restaurant. The full complement of the company's restaurants, listed in order of opening, are: Polpo Soho (October 2009), Polpetto (opened in August 2010, relocated within Soho in September 2012), Spuntino (March 2011), Polpo Covent Garden (June 2011) - previously known as da Polpo - Mishkin's (November 2011), Polpo Smithfield (2012), Polpo Notting Hill (2014) and Polpo Chelsea, opened in 2015. This restaurant successfully combines outrageous flair with the solid virtues of a bistro kitchen. This cosy little Kensington eatery has been spreading the love for over 40 years. A truly beautiful restaurant, this Kensington stalwart is named after Princess Margaret who used to regularly book there under the alias Maggie Jones. A gloriously over-the-top rustic decor features cooking paraphernalia and dried food hanging from the ceiling, mismatched crockery and wobbly wooden furniture. It's particularly appropriate for cosy winter dining, and romantic meals for two. The menu is thoroughly Anglo-Saxon, with rough pates, terrines and chunky soups on the starters list, a fish-pie that more than deserves its near-legendary status in the area, and plenty of high-quality, well-sourced meat (the game of the day is usually delicious). They hardly ever make any changes to the menu or dining room, which is just how the people of Kensington like it, returning week after week to eat the same rich, comforting dishes. You'll need to book early if you want to be sure of getting a table. There's nothing like a little high altitude to get hearts racing. Up the Oxo Tower drinkers and diners are treated to some of the best views in London, a gourmet menu, classy cocktails and occasional live music. Oxo Tower Restaurant is the ultimate date restaurant and the solicitous but discreet staff are well accustomed to making couples feel special. The commanding panorama which takes in the whole of London rivals the views from the London Eye. A very expensive but utterly special treat. Many may prefer to stop for a cocktail (easier on the pocket) and the bar welcomes casual drinkers, and serves the best martinis we've had in London. Their team of sommeliers will be on hand to help you select a wine from the impressive 800 strong list. An iconic spot with tons of London charm that has been put to its best possible use, the Oxo Tower Restaurant is a cut above. The tasting menu here is a once-in-a-lifetime experience. Following Angela Hartnett's departure from the restaurant at The Connaught hotel in Mayfair in 2007 the restaurant reopened with Helene Darroze as the two Michelin-starred Executive Chef from July 2008. Great ingredients, often sourced from small producers, are the secret to a relentlessly inventive menu packed with star dishes. The lunch/pre-theatre menu is particularly good value, but the tasting menu is a once-in-a-lifetime experience. Like the hotel's stylish Coburg Bar, the design is by Parisian designer India Mahdavi. Across the road from his Michelin starred Pollen Street Social restaurant, Jason Atherton branches out to open Little Social on a site previously occupied by Livio Bisterzo's fashionable Italian restaurant and which was originally a pub called The Black Lion and French Horn - the signboard lives on in the basement. With Little Social, Atherton gives diners an affordable bistro style restaurant offering a simple French menu and an interior based on the bistros of France with ox-blood coloured banquettes. Cary Docherty, who has worked with Atherton at Maze, is head chef, and brings with him six years of experience at Zuma, at Gordon Ramsay Royal Hospital Road and then at the Ramsay owned Foxtrot Oscar where he was head chef. Little Social is one of two new restaurants from Atherton to open in 2013, to be followed by The Social Eating House which opens on Poland Street, Soho, a month later on 18th April. Breathtaking views and Michelin-starred food are a match made in heaven. There are two genuinely terrifying things about the Hilton's 28th-floor restaurant Galvin at Windows: the first is the sheer distance from the ground; the second is the scale of the bill. Chris Galvin is most famous for a wonderful bistro in Baker Street, where he serves a similar menu of traditional French cuisine (though with fewer gourmet flourishes) for around half the price. There is nothing wrong with the food at Windows, which offers a combination of simplicity and style that is rare in top-end restaurants. It is just a bit galling to think that you could be eating the same stuff for so much less money. But of course, this is not a restaurant where the bill simply reflects the food: the view is absolutely as spectacular as you would expect, making this a wonderful place to take a date, impress a client or simply check out the greatest city in the world. Just be careful about which table you are booking, because there are a couple in the middle where you can hardly see anything. Dark, sultry and seductive. Hakkasan oozes Oriental romance. Boasting the first Michelin Star ever awarded to a Chinese restaurant, Hakkasan can justly claim to be the best of its kind in London. The food here really is exceptional. Straying from the traditional route to provide Western variations on Chinese staples the cuisine is both modern and mouth-watering. Also described as the "sexiest" restaurant in London, Hakkasan's appeal doesn't just rest with its food. Lurking underground at the end of a fairly unappealing (bordering on dingy) side-street, initial impressions aren't great. However, as you walk step by step down the dimly lit staircase, surrounded by cooling slate walls embedded with tiny ruby red lights, a whole new world opens up before your eyes. Bathed in a mysterious, icy blue light, the dining room's discretely placed arrangement of tables appear to emerge gleaming under the moonlight of an exotic Oriental night. Carefully placed screens create an air of privacy and subterfuge, further enhanced by the shadows created by flickering candles and dramatic spots of light. The suavely dressed waiters who slip silently in between tables and behind screens provide an appropriately unassuming yet attentive service, which is key to this whole dining experience. Expensive this is - it doesn't deserve to be anything else - but it's worth every penny. Let love blossom in the delightful Petersham Nurseries. When a top chef claims to be opening a 'simple', 'low-key' restaurant, it is usually press-speak for some folie de grandeur two doors down from the Ivy with an £85 tasting menu. Petersham Nurseries is the exception. Located in what can only be described as a shed (spacious, light and furnished, but definitely a shed), it's the sort of restaurant where you'll see the chef popping out of the kitchen to pick herbs from the garden, and where homemade lemonade sits above the Pinot Noir on the drinks list. And it's absolutely perfect, especially in summer, when you can sit in the garden. Superb meat and glowingly fresh vegetables peep from beneath mountains of herbs. Of course, all this rustic simplicity doesn't come cheap. Dirt floors, rickety furniture and food bought directly from tiny organic farms all over Europe are ferociously chic and prices are high for a restaurant that is such a long way from anywhere. Still, if you'd prefer a relaxed meal in a lovely location to an army of uniformed staff, then this is the place to go. As a lighter alternative, you can always settled for a cup of tea (from exotic flower teas to the traditional English Breakfast) and a nice slice of cake in the Teahouse. A slice of old-fashioned French romance, this quaint bistro will set hearts a flutter. Far away in the land of Putney there is a small French bistro run by husband and wife team the Ardillys. This charming little restaurant has been loved by locals for over ten years, outliving many of the other eateries that have come and gone in the area. Indoors you will find a cosy, homely scene which adds the necessary touch of French romance to your meal. You'll find all the classic dishes on the menu at L'auberge, frogs legs, foie gras, d'escargot, veal and boeuf borguignon. All cooked in traditional French style and served with affection. Be sure to save room for desert, the chef originally trained as a patisserie so the puddings are truly not to be missed. The typical creme brulee is reinvented here with a divine honey and lavender twist. Spotting a gap in the market for people sick of bog-standard takeaway pizzas. They created the 'French bites at home' service which allows fans of French gastronomy to dine on L'auberge delights in their own home, at quite easy-to-swallow prices. They also put on lots of event evenings which offer great food and wonderful wine at really great value. Bon appetit! Jason Atherton's City Social takes over the loftly Tower 42. Jason Atherton's City Social took over the Tower 42 spot vacated by Gary Rhodes. Situated high up on the 24th floor of the famous tower, the restaurant offers fantastic views of the Gherkin, the Cheesegrater and across the city. Head chef Paul Walsh (previously sous chef at Gordon Ramsay's Royal Hospital Road) has worked closely with Atherton to design the City Social menu showcasing the best of British ingredients. Interiors have a contemporary art deco look courtesy of Russell Sage Studios - all rosewood panelled boards, chrome and smoked glass, brass and mirror accents - centered around an open kitchen. The art deco theme is also felt in prohibition era cocktails served at the 85-seat bar and made with Scotch, gin and cognac to a menu by award winning mixologist Gareth Evans, and live jazz plays in the bar every Saturday afternoon from 12noon till 4pm. Jason Atherton is behind some of London's best restaurants with the Michelin-starred Pollen Street Social, Little Social across the street, Social Eating House in Soho, and Berner's Tavern at The London Edition, Ian Schrager's stylish Fitzrovia hotel. With City Social the chef, the first British cook to complete a stage at Spain's famous elBulli restaurant, proves there's still room for him to go up in the world. This mad, gorgeous, fairytale fantasy of a bar/restaurant is usually full of glamorous young singles flirting like mad over their cocktails - but it's also hard to think of a more romantic spot for a couple to go drinking. Hundreds of candles light the way through a maze of corridors, where huge fireplaces, and crazed decor - part ancient Rome, part Versailles - leap out of the darkness. Concealed little nooks with low ceilings offer the perfect opportunity to duck away from the noise of the bar. The cocktails are excellent, the wine list interesting and fairly priced, and the decor is beyond belief. The food is overpriced, but it is very good, and you know that you're paying for more than just a meal when your choice of dining rooms include the chapel, crypt and scullery. Guests can also opt for private dining at Beach Blanket Babylon with the choice of the Ballroom, a decadent room that can seat up to 60 guests or play host to a champagne reception for 110 guests or the Chapel, a semi-private enclave within the restaurant. The beautiful ballroom, nestled away on the first floor, is one of Notting Hill's best kept secrets. Rustic wooden furniture, cosy booths and dim lighting. Widely regarded as "the most romantic restaurant in London", the rustic wooden furniture, cosy booths and dim lighting certainly make Andrew Edmunds a great place for a date. Pretty flowers and classic drippy candles decorate the intimate (also known as small) tables and the place buzzes with loved-up vibes. The menu is a very British take on modern European dining with lots of sticky sauces, roast meats and crackly fat, as well as simple and breathtakingly fresh fish and seafood. The menu is handwritten daily and sits alongside a very pleasing wine list. Nestled in the backstreets of Soho, this townhouse bistro may lack a little modern slickness. But the friendly, efficient service and an absolute lack of pretension keep the customers coming back to this old romantic. This upmarket Russian restaurant is sure to impress. Following the success of sister restaurants in St Petersburg, Moscow and New York, upmarket Russian restaurant Mari Vanna opened in London in December 2011. Dmitry Sergeyev and Vadim Lapin founders of the Ginza Project chain - a group which owns more than 70 restaurants in Moscow and St. Petersburg - have teamed up with and Luca Del Bono, a co-founder of Quintessentially, to bring us Mari Vanna in Knightsbridge. It's a nostalgic take on Russia and the restaurant is filled with ironic touches including traditional nesting dolls, trinkets and kitsch knicknacks. The food may be home cooked and the atmosphere cosy but the high ceilings adorned with elaborate chandeliers, not to mention the glamourous Russian model clientele, make Mari Vanna a luxurious place to eat. The menu includes traditional dishes such as Pelmeni, Russian veal dumplings with a herb sauce, and Mari Vanna's signature dish - Borsch with Pampushka (beetroot soup with beef). There are Georgian and Ukrainian influences evident in dishes like Harcho, a rich Georgian lamb soup with rice, and Galubtzi, spiced meat and rice wrapped in cabbage leaves. And, as you'd expect, there's a vast range of vodka and cocktails made from vodka jars infused with horseradish, pineapple, cucumber, oat and honey - used in Mari Vanna's version of the Moscow Mojito. The best French restaurant in London within this price range. This Chiswick restaurant is one of London's best kept secrets. La Trompette is the best French restaurant in London within this price range. Dinner for two with a good wine will leave you with a wonderfully full stomach and only a mildly depleted wallet. The menu features regional delights from around France that will please any palate. Simply sublime. Sister restaurants of the same calibre, also owned by Nigel Platts-Martin and Bruce Poole, and most certainly worth a visit for a special occasion are Chez Bruce in Wandsworth and the Glasshouse in Kew. From cheap budget accommodation to luxury 5 star suites see our deals for hotels, including DoubleTree by Hilton Hotel London - Chelsea from 61% off.